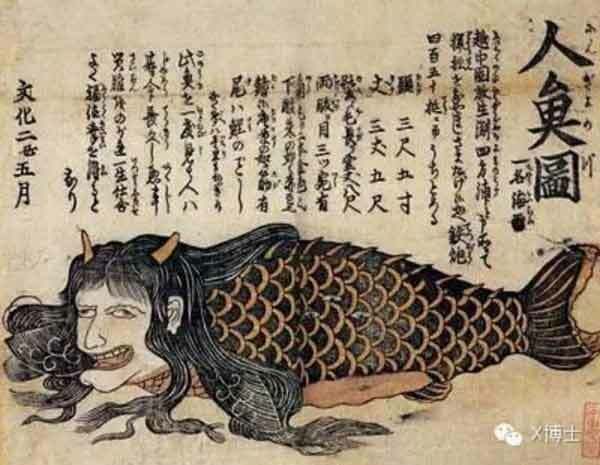 The Mysterious Japanese Mermaid – Real Or Imaginary? A mermaid is a legendary creature found in the deep oceans with the upper body of a human and the tail of a fish. They have made appearances in many folklores around the world and make for a very cute character in a fairytale. Many cultures around the world like the Near East, Europe, Africa and Asia claims to be home to these aquatic creatures. They are supposed to have various abilities like foretelling and provoking disaster, causing shipwrecks, stirring up storms and luring in sailors to their doom. Many sailors across the globe have claimed to see mermaids. Mermaid lore in Japan has its own long tradition. This should not come as a surprise because Japan is a nation surrounded by sea. These creatures are known as ningyo (人魚), literally “human fish,” as well as gyojin (魚人), meaning “fish human,” and hangyo-jin, (半魚人）or “half-fish human.” Some stories of fish like humanoids were circulated for centuries, but its first record was reported in the year 619. During the regime of Empresses Suiko, allegedly a mermaid was captured and presented in her court. It is said that this creature was kept in a makeshift tank for the entertainment of visitors to the court. A traditional image of a mermaid is a beautiful maiden’s torso and shiny holographic fish tail. But this Western vision of a mermaid is far from their Japanese counterparts. Before the influence of Western image of the mermaids, the Japanese mermaids were portrayed as ugly and bestial monsters. The only common feature in both the portrayals is the hair. 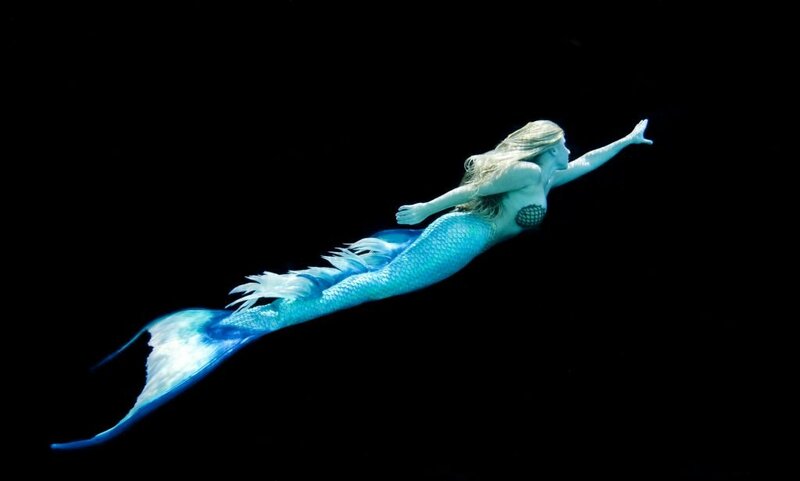 Mermaids are often described as having long and shiny hair. 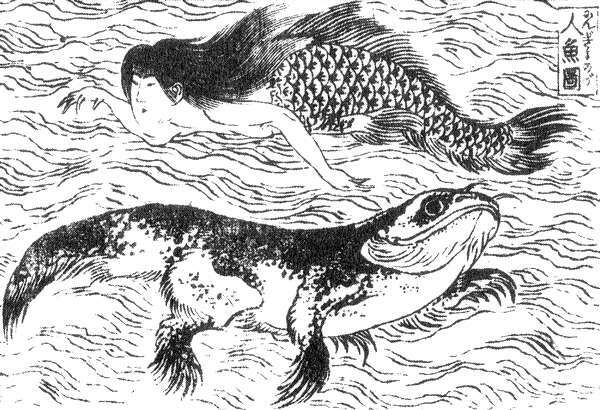 Japanese mermaids more commonly known as Ningyo are often depicted like a cross between fish and a monkey. The arms are scaly and end up in a twisted claw. Japanese mermaids had no appendages at all, and were often said to be just a humanoid, ape-like, or reptilian head with sharp teeth upon a fish body instead of possessing a full human torso. The heads of these mermaids often ranged from misshapen, horned, or possessing prominent fangs or rows of pointed teeth like those of a shark. There have been tales of just a head attached to the body of a fish. Humanoid Japanese mermaids were depicted in more demonic and sinister fashion. Some of them had white skin and high, musical voice which sounded more like a flute or Skylark. Just like any other mythical creature mermaids of Japan have mystical powers, which they never used for any good. It was believed that Ningyo cried tears of pearls and eternal youth and beauty would be imparted upon any human being who consumed a mermaid’s flesh. There are some legends that state that women who consumed mermaid’s flesh had miraculously ceased to age or revert to a younger, more beautiful form. Merfolk from Japanese folklore were said to have shape-shifting abilities. There are many instances of mermaid transforming into humans or other creatures. A good example would be, instances in 1870s where lighthouse keepers at the Cape Nosaapu Lighthouse in northeast Hokkaido were believed to be lured in by the mermaids. The mermaids were thought to masquerade as beautiful, kimono-clad women on shore that would seduce and lure men into the sea. Once the lighthouse keepers became mesmerized the Ningyo would then transform into giant jelly fish and kill the foolish keepers who would go for a swim with them. Mermaid sightings were a common phenomenon in earlier eras from 16th to 19th centuries and were not considered as figments of imagination. A modern account of mermaid sighting was recorded in 1929 when a fisherman by the name of Sukumo Kochi captured a fish-like creature in his net that had a human face upon the head of a dog. The creature then broke free from the net and escaped. During World War II, mermaids were a frequent sight, especially in the warm waters of Okinawa. Japanese navy personnel reportedly opened fire on these mermaids but no bodies were found to prove these claims. These reports were made by fairly high-ranking military officials, so it is difficult to know what to make of such reports. Western explorers also have reported few accounts of Ningyo sightings. A Britain captain saw one such mermaid from a pier at the port of Sentojonzu. But this mermaid was described as a being with a head of a woman and the bottom was all fish. There are many noted accounts of mermaids in the logbooks of Western seafarers. Some captains were known to avoid the famous haunting places of Ningyo so that they do not come across any mischievous creatures. What were the Western seafarers seeing and what were fishermen dragging up in their nets? Surely it seems to be stretching credulity to suggest that experienced seamen would routinely see living mermaids due to being influenced by the sight of a faked one. Is there perhaps something more going on here? The fishermen and seafarers may have seen Ningyos as real but there are more clues to their existence in ancient encyclopedias of Japanese wildlife. In these encyclopedias mermaids are portrayed as real aquatic creatures. One of the best examples can be found in the works of Keisuke Ito. He is a respectable doctor who brought the Western medicine to Japan. He was known to make realistic sketches of all marine life that were compiled and sorted as zoological catalogues. The realistic sketches of mermaids were found with the other realistic and anatomically correct pictures of other animals. Unfortunately, whether the Japanese mermaids were real or not may not be known for sure. There have been decline in sightings after 1800’s and very few modern accounts to support the existence of Ningyo. Perhaps there a long forgotten mummified mermaid sitting on a shelf of some museum collecting dust and assumed to be a fake.